Vidyarthi Bhavan, this is a place which I was seeing from many years but never tried to step inside. Seeing the outlook of it I thought this would be one of those small military hotels but surprisingly this place was always crowded any day given. 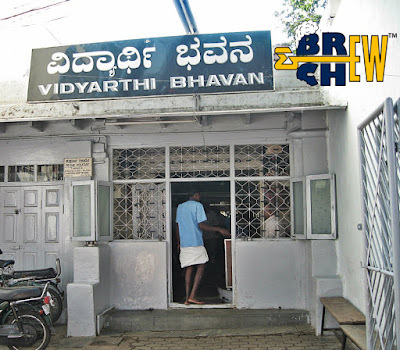 One day a very good friend of mine and me decided to meet and the place was Vidyarthi Bhavan. Although I hesitated initially, my friend insisted we go there. Finally I too became part of the rush that day and we ordered masala dosa. I felt the place was unique coz all the waiters were in dhoti (Guys Frock) and each one was holding atleast 10-12 plates of the orders given by the foodies there. When the waiter finally reached my table, we started relishing the food and it was awesome. Later got to know that is a six decade old hotel and people from all generations are still thriving to this place. Now this place has become regular adda for me and my friends. This place is crowded like forever any time you go. So be ready to wait a little longer to get inside the hotel but the wait is worth to relish yummy delicacies. The craziest thing here is, the people stand just behind your seat waiting for you to vacate the place so don’t feel weird about it, instead enjoy the food and do not bother about the people standing behind staring your plate. If you are thinking that you can take your girlfriend/boyfriend to this place to relish local food and for some private time then this will be a wrong place for it. Do not expect any privacy in this place. The menu of this hotel is too small but it has not lost its charm even after decades. Masala dosa is very famous here and believe me or not, these ghee-fried dosa will make you forget all your diet regimes for time being. The other dish which is a must try here is masala vada. So take your gang of friends or family or just go alone to relish the tasty food here along with hot coffee or tea. Cost: approx Rs.150 for two.